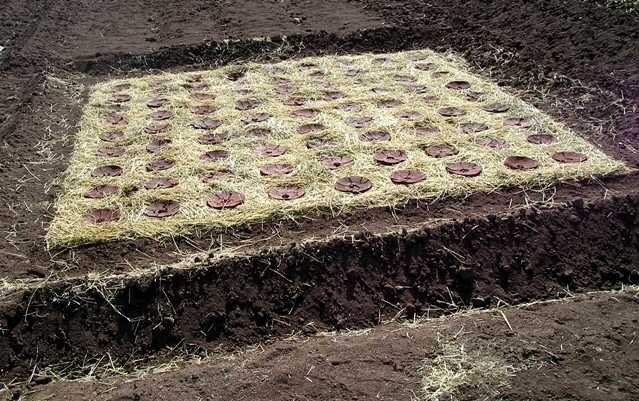 In 2009 a group of New Mexico arts organizations joined together to present LAND/ART, an exciting series of exhibitions, site-specific art works, and lectures exploring the relationships between land, art, and community. 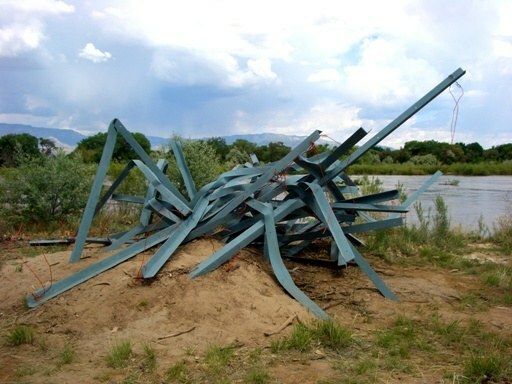 Many of the pieces that came out of the project can still be seen near the Open Space Visitor Center. 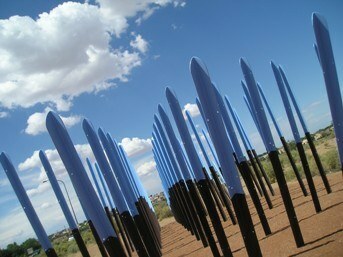 Flyway is an iconic piece of public art that is located near the Open Space Visitor Center. Aritst Robert Wilson talks about Flyway his latest work that was commissioned by the Albuquerque Public Art Urban Enhancment program. 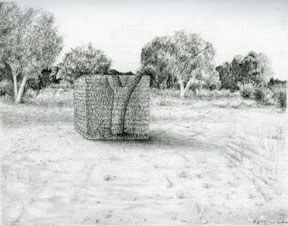 An installation made from a segment of fallen cottonwood trunk at its core, and reclaimed heavy-gauge wire coiled sparingly into open rectangular building blocks that will surround the trunk. 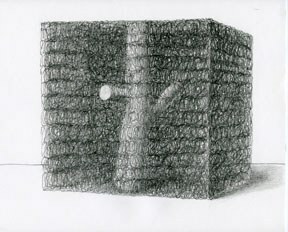 The significance of Cube is in its symbolic representation of the Rio Grande Bosque: a preserved natural corridor coursing through the urbanization of the Albuquerque Metropolitan area. 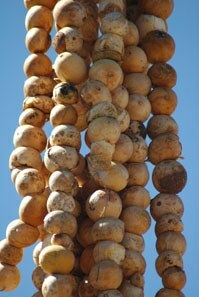 The cottonwood represents this life-giving habitat. 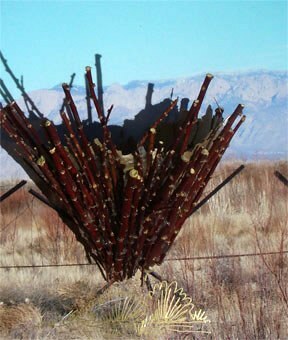 An installation of three pole sculptures composed from natural, locally-gathered materials of the Bosque. 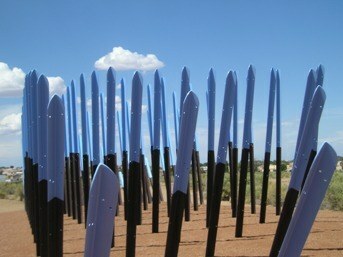 "Like a political flag, the sculpture also functions as a signpost. An allegiance to and an alliance with the natural world is expressed, raised high for all to see." 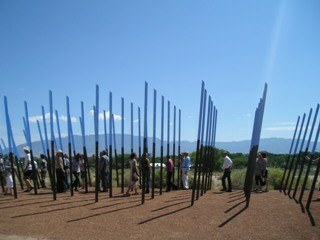 An installation that provides a use for the existing Jetty Jacks to become water harvesting features within the Bosque. Located on site adjacent to the walking path along the river. Constructed of downed, dead cottonwood branches found in the Bosque, the dome is site specific and envisioned as a structure for contemplating the bosque environment, as a place for story telling, tai chi or countless other human uses. 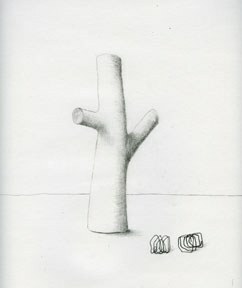 It is also a sculpture in and of itself made from the materials found within the forest and in constant "dialog" with the "dome" of branches of the living trees around it. 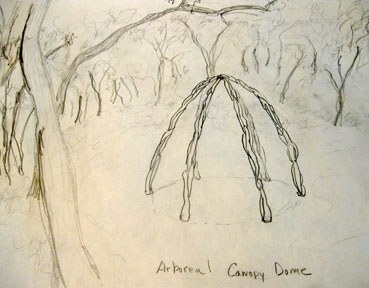 The naturally bleached and barkless branches of the dome would be visible from many aspects along the bosque trail. 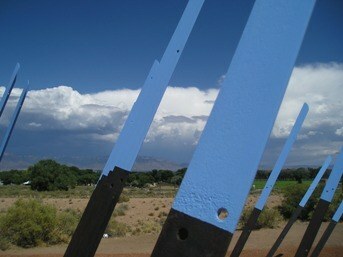 Located in the south-east side of the River Loop Trail in the Bosque, Meisner will use organic milk-based paints that are environmentally safe (VOC free) and designed to bio-degrade to re-color the existing Jetty Jacks, altering the appearance of their presence in the Bosque and the viewer's perception of the Jacks in this environment.